In the estimation of many, Ephesians is Paul's crowning work, "the quintessence of Paulinism. "1 It is both a literary gem and a treasure of spiritual nuggets. Those who study it may not fully plumb its depths, but will glean important understanding of Christ and his Church, as well as lessons for life. Before we get into the book itself, let's see what we can learn about it. Language. Ephesians includes a number of words not found in other Pauline letters. Style. The first half of the Letter, especially, has a full and lofty style, unlike other Pauline letters. Theology. The Letter's view of Christ is cosmic in scope and the author's understanding of the Church, too, is advanced. Colossians. Many elements of Ephesians are similar to Colossians, so much that some scholars see "borrowing" from the ideas in Colossians. Personal References. Unlike Paul's other letters, Ephesians doesn't include greetings to various believers in the church to which he was writing. Of course, each of these objections can be answered by those who believe Paul to be the author. Paul is a highly educated man, quite able to express himself in different ways, depending upon his knowledge, the revelation he is seeking to express, and the heresies he desires to combat. If you consider the different styles and language usage skilled communicators are capable of today, it's not hard to grant those abilities to Paul. The theology is not discontinuous with other Pauline letters, but builds on them, reflecting growth in understanding that comes from both revelation and theological reflection resulting in a bigger vision of Christ and his church. And as for borrowing from Colossians ... if Paul is the author of both Colossians and Ephesians, the concept of borrowing becomes pretty silly. There are two very good reasons to see Paul as the author of Ephesians. Tradition. Ephesians was considered authored by Paul from the earliest days of the church, and quoted by the earliest of the Apostolic Fathers -- Clement of Rome, Ignatius, Hermas, and Polycarp. Even the non-orthodox acknowledged it as Pauline -- Marcion, Gnostic writers, the Nag Hammadi documents, and others. In the early church, Pauline authorship was never once questioned. I believe Paul was the author of Ephesians and am joined by a number of recent scholars, including Marcus Barth (1974), F.F. Bruce (1984), and Peter T. O'Brien (1999). The case for Pauline authorship, in my view, is substantial and convincing, while the case against it is speculative and (except to some scholars) pretty spotty evidence on which to overthrow Apostolic authorship of Ephesians. 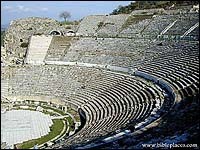 Paul founded the church at Ephesus over a period of nearly three years (Acts 19:1-20:1), from about 52 to 55 AD. He visited with the church elders on the beach at Miletus on his way to Jerusalem (Acts 20:17-38). In Jerusalem, Paul was arrested about 57 AD and imprisoned, first in Caesarea (about 57 to 59 AD) and then under house arrest in Rome about 60 to 62 AD. (Acts 28:16-31). He probably died no later than 63 to 65 AD, and probably earlier. Paul obviously wrote Ephesians from prison (3:1; 4:1; 6:20), but prison where? We can't be sure, but likely in either Caesarea or Rome. Most who hold Pauline authorship date the Letter approximately 60 to 62 AD from Rome. The Letter seems to have been written to the Church at Ephesus (1:1), though it doesn't directly address problems in that church as do some other letters. It seems more like a tract than a personal letter, and was probably intended as a circular letter to be read in the house churches of Ephesus and western Asia Minor (the western portion of present-day Turkey). Ephesus was founded by Ionian colonists about 1100 BC and over the next millennium ruled successively by the Persians, Greeks, Macedonians, and others. Rome ruled the city from 69 BC for the next 200 years. It prospered and became the provincial capital and leading city of the entire region. Estimates of its population in the first century begin at a quarter million inhabitants and go up from there. 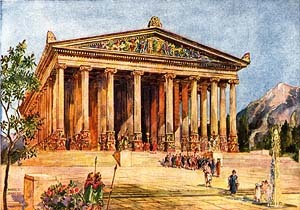 Artist's rendition of the Temple of Artemis, considered one of the seven wonders of the ancient world (by British artist Harold C. Oakley). It was famous for its temple to the goddess Artemis (Diana of Ephesus), a huge structure made of marble, 220 by 425 feet at its base, supported by beautiful pillars and rising to a height of 60 feet, considered one of the seven wonders of the ancient world. The city has been studied by archeologists since 1895 and the work continues. Some of the important buildings, present during Paul's ministry, include a huge theater on a hillside that could seat 24,000 people, mentioned in Acts 19:29ff. Others were the town hall (Prytaneion), the commercial market (Agora), baths and gymnasiums, a medical school, and a stadium 229 meters long and 30 meters wide built during Nero's reign (54-68 AD). Besides the cult of Artemis, there is evidence of various mystery religions, the practice of magic (Acts 19:19), worship of Egyptian gods Sarapis and Isis, as well as devotion to large number of other deities: Agathe Tyche, Aphrodite, Apollo, Asclepius, Athena, the Cabiri, Concord, Cybele (the Mother Goddess), Demeter, Dionysus, Enedra, Hecate, Hephaestus, Heracles, Hestia Boulaia, Kore, Nemesis, Pan, Pion (a mountain god), Pluto, Poseidon, Theos Hypsistos, Tyche Soteira, Zeus and several river deities. But there's a real question whether Paul's Letter to the Ephesians was really intended for the Church at Ephesus. Let me explain. In verse 1, the phrase "in Ephesus" is missing in several early, reliable Greek manuscripts.4 Probably the explanation is that the original letter was intended as a sort of circular letter for the Church at Ephesus as well as others in Asia Minor, to be read and then sent on. Since Ephesus was the best-known church in the area, the copy it made would be the source of most of the copies of the Letter made for others, probably inserting its own name in the first sentence. Indeed, the subjects in the Letter don't seem to be tied to the particular situation in Ephesus so much as in the churches in general. Nevertheless, we'll still refer to the Ephesian church as the primary recipient, even though there were probably other intended recipients, too. Why was the Letter written? Since Paul's founding of the churches in the area around Ephesus, believers seem to have won many Gentiles to whom Paul's Letter is now directed. They were converts from a Hellenistic environment of mystery religions, magic, astrology, etc. They feared evil spirits and weren't sure about Christ's relationship to these forces. They also needed encouragement to adopt a lifestyle worthy of Christianity, free from drunkenness, sexual immorality, theft, and hatred. They also may have lacked respect for the Jewish heritage of their faith. The Status of Believers "in Christ"
We'll be exploring each of these as we begin to look at the text. The structure of Ephesians can be considered in halves. The first half, chapters 1 through 3, concern theological or doctrinal issues, while the second half, chapters 4 through 6, deal with ethical and practical outworkings of the Christian faith. Ephesians is as inspiring as it is deep. It swells the soul in praise, encourages the mind in understanding, and warms the heart in giving thanks. As you begin this study, immerse yourself in this short letter. Read the entire letter through several times -- in different translations, if you can -- to capture the big picture of what Paul is saying. As you read, let your spirit listen and soak up the wonderful truths. Reading aloud helps you hear with your ears what God is saying as these themes weave in and out, dancing with each other for sheer joy. You are about to expose yourself to one of the richest passages in all of Christian Scripture and literature. All the lessons are now available as an e-book or printed book for your convenience. As you begin your study of Ephesians, I encourage you to give priority to prayerfulness rather than merely logical analysis. Paul's Letter to the Ephesians is designed to lift his readers from an earthly, worldly point of reference to a heavenly, spiritual one. While we'll analyze Paul's message and its implication, we must go beyond understanding to experience. Paul's prayer for us is "that you may know him better." Father, together we ask you that you might accomplish your purpose in our hearts and lives through this Letter to the Ephesians that your Spirit inspired Paul to write. Let us grow up in you to the full stature of Christ. In His holy name, we pray. Amen. Those who claim Paul was not the author point to a supposed Christian tradition and literary device of pseudonymity, wherein later works are attributed to great Christian leaders, not as a fiction but a way of honoring them. The truth is that while there were many pseudonymous works in the first several centuries of the church, there are no pseudonymous works in the New Testament canon. The early Fathers were insistent that the New Testament be a record of the apostles' teaching. Donaldson asserts, "No one ever seems to have accepted a document as religiously and philosophically prescriptive which was known to be forged. I do not know a single example" (L.R. Donelson, Pseudepigraphy and Ethical Argument in the Pastoral Epistles (Tübigen: J.C.B. Mohr, 1986), p. 11; cited by O'Brien, p. 40). Information for this section came primarily from Clinton E. Arnold's articles: "Ephesians, Letter to the," DPL, pp. 238-249; and "Ephesus," DPL, pp. 249-253. "In Ephesus" is omitted in p46 Aleph B 424c 1739 Basil, Origen, and apparently Marcion. The vast majority of the manuscripts include the phrase, but its absence in the early manuscripts provide strong external evidence for the omission of the place name as being original (O'Brien, p. 85, fn. 5). Edwin M. Yamauchi, "Gnosis, Gnosticism," DPL, pp. 350-354. Arnold, "Ephesians, Letter to the," DPL, pp. 247-248.